A story about a day long ago at my grandmother’s stove! It was not that long ago when our mothers and grandmothers spent long days during summer and fall preserving fruits and vegetables for the winter. Canning was a serious job during the summer and fall preparing larger quantities of canned food for the winter months. Therefore, family members and farm help were part of this huge endeavor at my grandparent’s house when it came time to preserve the garden’s bounty. My grandparents house was in Veliscovci, Croatia; a very small village that had no electricity and “city water.” Every home in the village had its own well and plenty of wood to both heat the house and cook on a wood-burning stove. 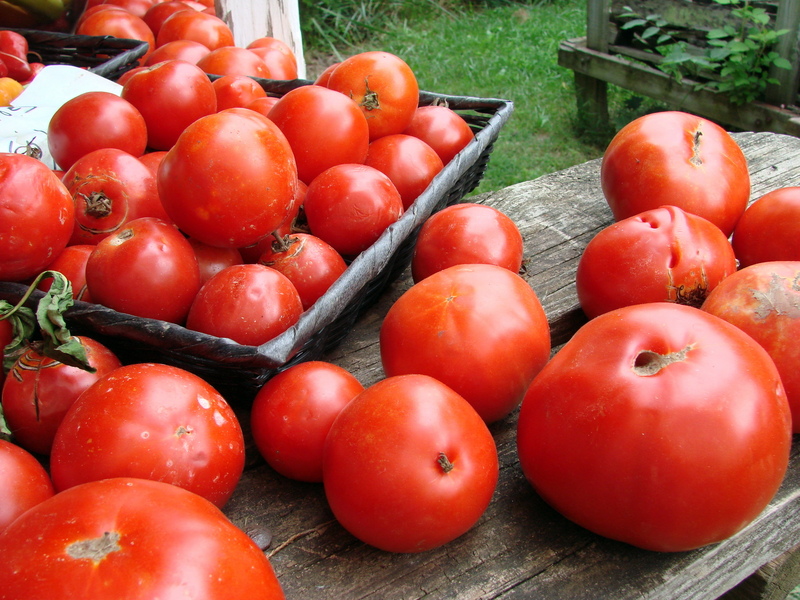 My fondest memories as a 5 year old child are days in August and September when the tomatoes reached their peak in sweetness and the tedious job of making tomato sauce made everyone feel on edge. There was tension in the air because there was so much preparation ahead of the actual making the tomato sauce. The tomatoes were picked early in the morning and washed at the well before they were brought into the kitchen. They had to have no blemishes, since the usual fungus/mold that spoils the tomato could not be killed by just cooking the fruit. Once they were dry, they were cut into pieces and placed into big pots to cook on the wood-burning kitchen stove. The tomatoes in the pots had to be stirred continuously and kept at a slow boil. This went on all day until the sauce became very thick. The village women whom my grandmother employed for the day had to take turns in stirring the sauce to prevent the scorching on the bottom of the pots. When the sauce was thick enough, it was strained through a vegetable strainer and placed back onto the stove to cook again to re-sterilize it. In the mean time other women prepared the bottles or jars, washing them and then boiling them in huge kettles that were stationed in the yard over burning logs. After they boiled a certain amount of time they were placed on wooden racks with pegs to drain them. These sterile bottles were then filled with the boiling tomato sauce. Under my grandmother’s watchful eyes (to ensure that no contamination occurred) the bottles were filled with the tomato sauce and sealed with cork stoppers and finally placed into baskets that were lined with feather pillows. The pillows were covered with old sheets so protect them from any spilled tomato sauce. The filled bottles were kept in these baskets until they cooled to room temperature. The cooling process had to be very slow since the stoppers would occasionally pop out of the bottles, like a cork would from a champagne bottle, and spray all over the kitchen and everyone in it. As I was allowed to watch from a distance I always thought it was very funny that the sauce covered not only the whole kitchen with red spots but also the people in it, much to my grandmother’s distress. 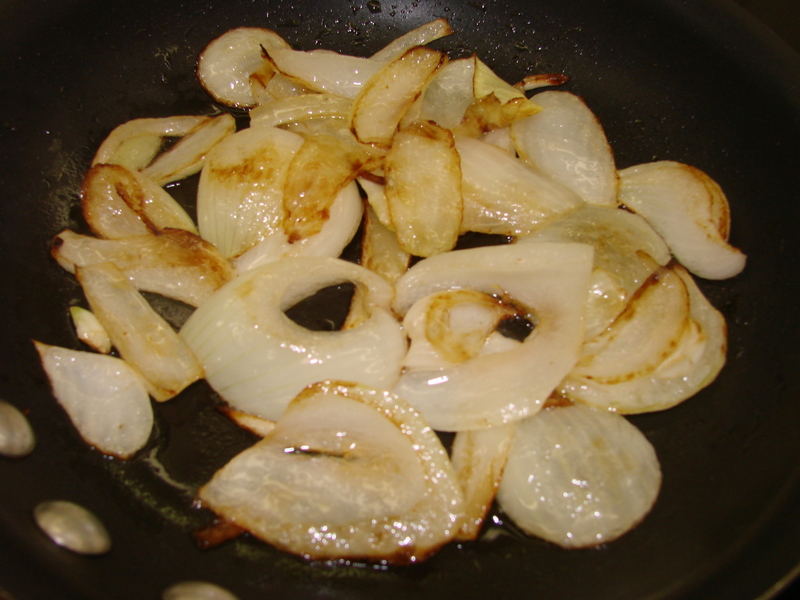 Into a frying pan add 1 Tbsp of oil and the sliced onion. 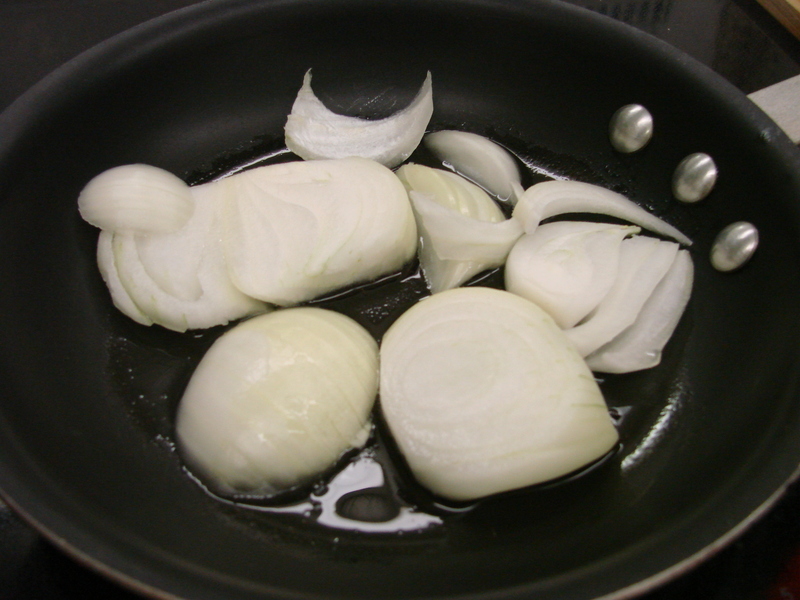 Caramelize the onion to a light brown color and transfer it to a Dutch Oven. 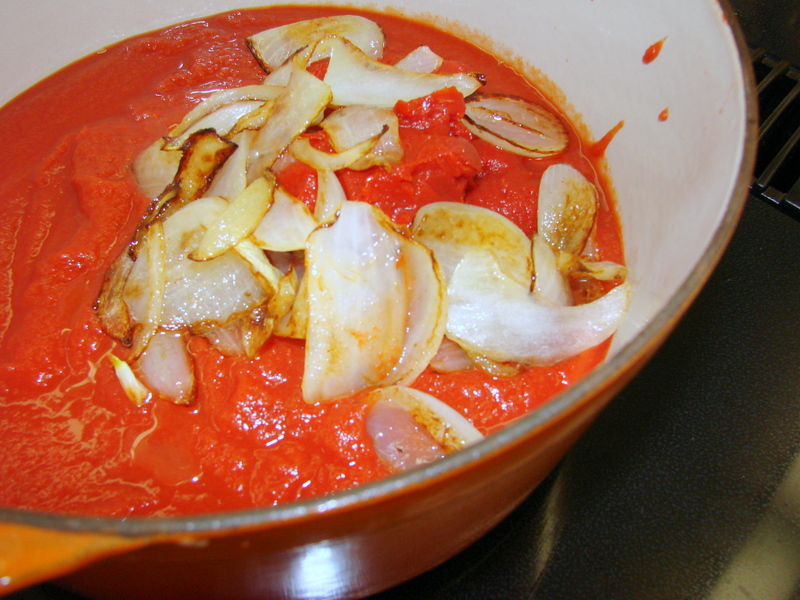 Add the pureed tomato sauce and the tomato paste….also add the chicken broth. Mix this soup all together and bring to a medium boil…….mix slowly ….reduce the heat and let it simmer………. for about 15 minutes……stirring occasionally, then add the 1/2 cup of heavy cream and mix again. Before serving, scoop out the onions with a slotted spoon and add sugar and salt then taste…to adjust the flavors. Add a dollop of lightly whipped heavy cream or a small spoon of sour cream on top of every bowl and a sprig of Basil or Parsley. 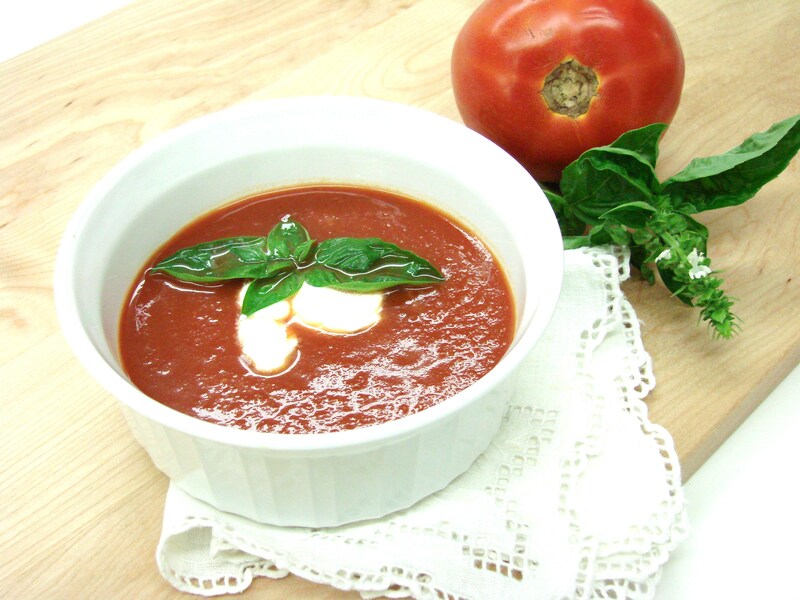 Note: Do not cook the basil in the soup and do not add garlic…….it would taste like a pasta sauce or pizza……..My mother told me that the only flavor one should taste is the onion, salt and pepper…..but, you can decorate the bowl with a basil leave or parsley.. The fruit jams were prepared in similar manner as the tomato sauce only they were cooked outside in the big kettles over an open fire. The kettles were stirred with long sticks that had a chain attached to them. The chain was place into the pot and by moving the chain around on the bottom of the kettle all the fruit was mixed quickly and efficiently. Just a small amount of sugar was added to whatever fruit was being cooked. Again constant stirring was necessary until most of the water evaporated and the jam thickened. Then the jam was placed in jars which had been boiled and drained. As soon as they were filled they were placed in boiling water to be reheated to simmer. The jars were taken out of the simmering water and covered with the lids. As they cooled the lids tightened and sealed. At this point they were ready to be kept for the winter in the pantry. Since I had this early experience of “preparing for winter” I still do some preserving every summer and fall. However, my methods are so much simpler and quicker. I only preserve fruit. My favorite is Apricot Jam. I would not be an Austrian if I did not love Apricot Jam and not think of it as the “Nectar of the Gods”. 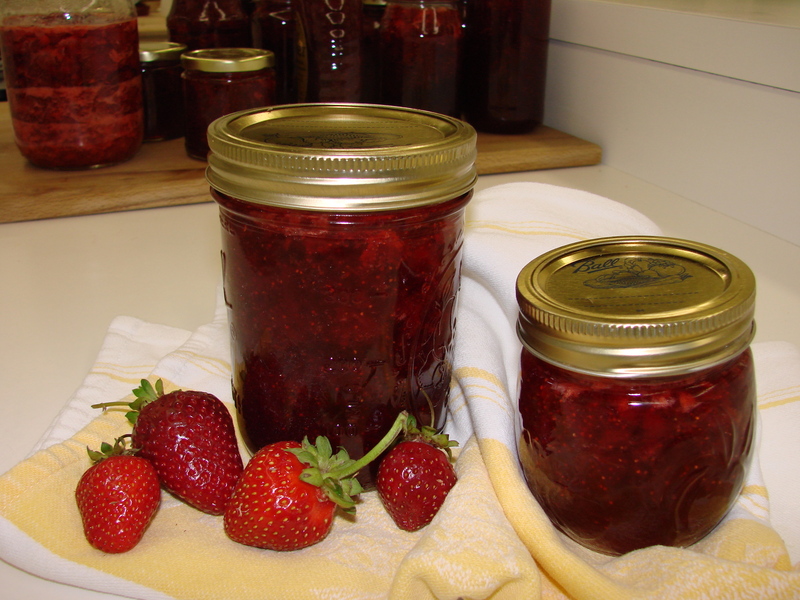 Strawberry and Raspberry Jams are other favorites in Austria. 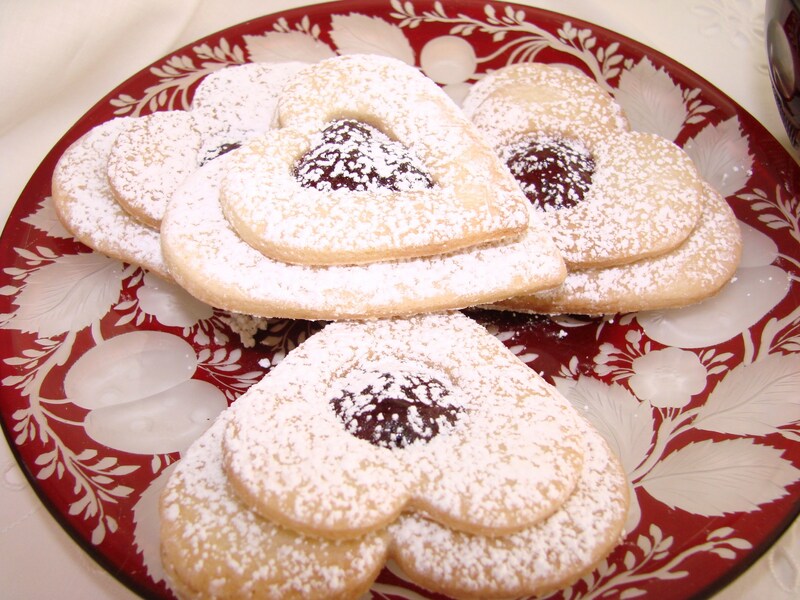 These jams are used very frequently in Austrian pastries. When I make my jams I follow the simple instructions on the box of Ball’s “Fruit Pectin,” produced by the Alltrista Corp. I use jars which I collect thru the year, wash them well and run them thru the dishwasher just before I use them for my freshly cooked jams. 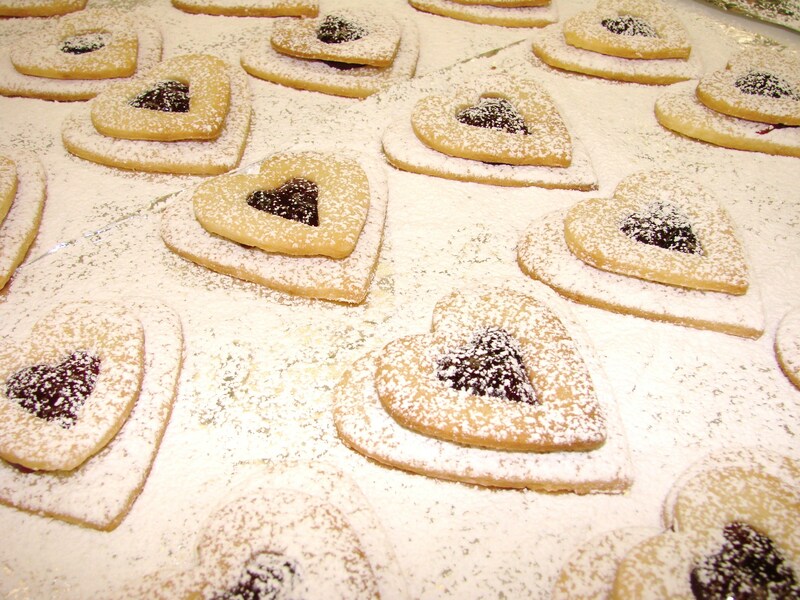 Once filled with the hot jam I quickly cover them with the lids and let them cool to room temperature. The lids seal as they cool. I keep my jams in a refrigerator in the basement, sometimes up to two or three years, however, they seldom last that long because I use them making my Austrian pastries and we eat them or give them away as gifts. Share your ‘grandmother story’…….how she cooked and if you cooked with her. What meals did you like best in your grandmother’s kitchen? You have such a lovely blog! Lili Rollins sent me a note on it last week and thought I’d be interested in seeing it. I love the stories from your childhood. I spent nearly 3 weeks traveling Croatia a couple years ago and fell in love with the people and the countryside. so good to have you here! I am happy that Lili sent you to stop by…….and I hope you will be visiting often………….Do share with me your memories of Croatia…..I love that country as well…..only have not been there for a while…………..
Love to read your stories Maria! Thank you so much for sharing them. This one brings back memories of my mother and grandmother canning and cooking in the kitchen making a wide variety of things from jam to canned vegetables and baking. Ah, sweet memories! Thank you – Linda……you always brighten my day with your comments!!!! Lots of love to you………. Your memory is so vivid and how fortunate we all are to have you share them with us. What a treasure this is for all of us, Maria! Thank you – Donna for your nice and sweet comment……..it is so great to hear from a relative….you are very special to me…. I have to admit I haven’t been much of a blog type person, but I’ve enjoyed your emails and links to your stories and recipes. It’s always nice and fun getting comments about food from your home country. From – Joan Buchanan…..via email………..
Hi Joan……..I am sooooooooooooo happy that I am tempting you….to take a pot and do some cooking….because, everything that I ever ate that you prepared was very, very delicious….I still remember that wonderful salad the last time we were at your table………….. Thanks for the story about your grandmother. I use to help my grandmother cook also. The family gathered at her house for these endless meals of at least ten courses each piping hot and seasoned to perfection. All done on an small wood burning/gas stove a third of the size used today. The stove had a shelf at the top where she placed the food as she cooked. I still think of it as magical because it was there that all the food was kept warm for the meal and always was piping hot when served. Amazing. I helped her can during the canning seasons but my favorite was helping her make raviolis. When I was very small my job was to grate the parmesan cheese. As I got older I helped make the raviolis. She made them for all holidays and birthdays. It is a wonderful memory that I cherish to this day. She had a ravioli table that was made especially for her from somewhere in San Francisco’s Little Italy. I still have that table today. As I carried on the tradition of making raviolis my children became interested in learning. Today my son, Robby, is the master ravioli maker of the family. I had a ravioli table made especially for him. He makes raviolis for the holidays but also treats the family to gourmet raviolis during the year always experimenting with new recipes. He gets so excited when he makes a new recipe or a new gravy (not sauce) and cannot wait to share it with all of us. Betty…………I loved reading about YOUR grandmother…..it is so special when we have those memories to fill our life with joy with thoughts of the past………. Thank you for sharing these special memories with me….I really, really appreciate you sharing them with me……….. It was great chatting with you as well the other day………now that I have your new phone number I will be calling you again soon……….